In our article last month, we reviewed the case for serving veterans and their family members through community-based agencies. These agencies can go well beyond what the Department of Veterans Affairs (VA) is able to do to provide services and supports to the 40 percent of discharged veterans with children. 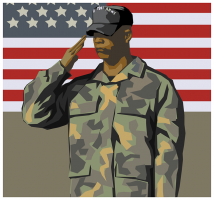 The VA focuses on veterans, but state, local and community agencies can help their families. But how can these agencies and those that serve veterans directly work together to achieve better results and wider funding? There are three critical ingredients to such an effort by local agencies working in collaboration: The numbers: how many children and veterans live here? The need: what services and supports do they need? The networks: which agencies can provide those services, working across agency boundaries and how can they be held accountable for results? Each of these steps, undertaken by a group of agencies and organizations working as a coalition, can make a big difference for the 30-35 percent of veteran families affected by a returning veteran’s trauma and substance use problems. What we currently know is over 2.4 million active duty service members were deployed to Iraq and Afghanistan since 2001. An estimated 40 percent of them are now veterans separated from service, living in their communities. Roughly one third of those separated veterans are married, over half have children, averaging two each. Most recently, the VA has published data for the total number of children of veterans of recent conflicts. Based on the VA data on the percentage of children of veterans affected by family disorders such as PTSD and substance abuse, we can estimate the total number affected in your area. Last month’s article reviewed some proven ways to identify these children so that they don’t become “invisible children,” who need services but have no status in the services system. You can’t coordinate what you can’t count. Knowing the total number of veterans in your county or state and the estimated annual increase in those veterans is a vital set of facts. Just as important are the number of veterans served by the local and regional VA health facilities, total homeless veterans, total unemployed veterans, and the total veterans attending college. All of this data is available through local agencies. Approximately 30-35 percent of separated veterans exhibit symptoms of PTSD and/or substance abuse. These are problems which affect the entire family, with an impact on children’s cognitive learning, emotional stability and risky behaviors. Some of these children need early identification and screening, substance abuse prevention services and mental health services aimed at social and emotional stability. Veteran-serving agencies don’t always understand that when they serve the veteran, they are also serving the family. Employment agencies serve veterans’ families, because child care, child support, health coverage, transportation — all of these affect veterans’ ability to get and keep a job. Housing agencies serve veterans’ families. Are housing units for single veterans — or for families? The essential component of needs is the missing box on the form: How many veterans are in our caseload? We know from the literature that what affects one member of the family affects all of them. In veteran agencies that work with veterans every day, front-line staff can learn about what is needed and available to families by asking about their children, spouses and partners. Once you have completed your intake and you are aware that the client has kids, spouses, or partners, you can refer that family to agencies that work with children and families. Their case management can keep your agency informed while working with the family on other referrals, linkages and possibly counseling. Several cities, counties and regions have formed veteran and military family collaboratives, made up of both veteran-serving agencies and their civilian children and family-serving counterparts. These networks can do their own resource inventories, and gradually, as they build up information about services and needs, they can develop an annual report card that tracks not only who is being served — but how they number compares with total needs in the area. That results in a network that is not just a bunch of meetings, but a coalition of shared accountability fort results. Putting these pieces together is a kind of services integration — a phrase which reminds us that the military services have been working since 1947 to develop a unified response to our nation’s adversaries. The same kind of unified response is needed to respond to the needs of veterans and their families. We can’t count on the VA to do that job — they have their hands full serving veterans. It’s up to the rest of us, guided by our answer to the central question: should any child or family member be worse off because his or her parent served their country? The answer, of course, is NO. That’s where our mission begins.